The Commemorative Air Force was founded in 1957 and chartered as a non-profit in 1961 to restore, preserve, operate and maintain WWII-era aircraft. The CAF also provides museums to protect and display aircraft, as well as to perpetuate their memory and heritage. 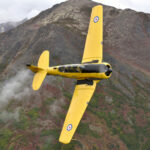 The Alaska Wing is dedicated to preserving the military heritage of Alaskan aviation, and flies the bright yellow AT-6 Harvard Mk IV, the yellow and blue BT-13, and the L-2 Grasshopper. 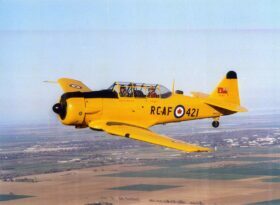 The Harvard MkIIB was built under license in Montreal for the Royal Canadian Air Force, the RAF and the USAAF, with a total of 2,557 built. The Harvard was known to fly to Annette Island in Alaska during WWII, where Canadian units were stationed, adding strength to the 11th Air Force. The BT-13 was first flown in 1939, and was the WWII-era basic trainer flown by most pilots. Pilots would graduate to the advanced trainer, the AT-6, prior to being assigned to their main fighter aircraft or bomber. The L-2 Grasshopper was manufactured by Taylorcraft beginning in 1941 and was used an observation aircraft during WW-II to spot enemy troops and supplies, as well as direct artillery fire. 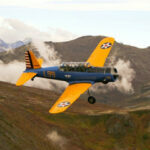 After WWII, many aircraft were converted to civilian use and flown around bush Alaska.